Dream Day Wedding: Bella Italia: Light the candles and set the mood! Your flourishing business is taking you overseas to orchestrate the flawless wedding details for a bellissimo couple. From the perfect proposal to cutting of the cake, bring this charming adventure to life. Uncover hidden items, visit famous Italian landmarks, explore historic works of art, and restore tender memories. 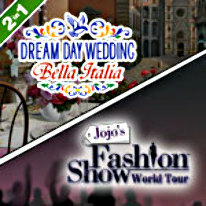 Jojo's Fashion Show: World Tour: New models, hot styles and an all new Design Mode await you in the highly anticipated Jojo's Fashion Show World Tour. What's new? You get to design your own gorgeous outfits and see them on the runway! Select from sultry Flamenco or sleek Paris Street as you deck out ultra-realistic new models and join the Las Cruces ladies on their latest adventure! Designers at heart will love concocting their own runway-ready pieces in a never before seen design mode!